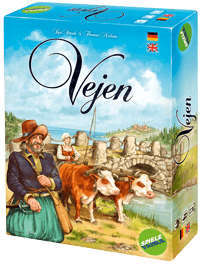 In Vejen, you slip into the role of a merchant in the early 17th century. On many trade routes (Danish: VEJEN) connecting villages in Denmark and northern Germany, you need to set up trading houses and travel long distances to buy and resell goods. Those who keep track of the exchange rate and foster their trading network best will win.